I share my Op Ed on late Aslam Azhar published at Urdu Times in its various North American and European cities. It is in Urdu and I have penned it as a duty of a writer to share about a great Pakistani who has undoubtedly indebted the nation with his contributions as well as sacrifices in upholding values, culture, justice, and rights, as well as enriching Pakistan through his work in establishing Television there. Those who may not read Urdu may read some articles on him by googling. Friends, Writers Forum celebrated Jon Elia, an essential Urdu poet, writer, and philosopher, in Canada. We now share a collection of videos of the event, which will engage you and provide you intellectual bliss. provoking essay by Dr. Tahir Qazi, renowned artist and painter Shahid Rassam’s memory of Jon Elia. (We will add the compositions of Jon Elia’ poetry immediately after this). Here is a very informative review by Annemarie Schimmel of H. T. Sorley’s Shah Abdul Latif of Bhit, one of the most important books on Shah Abdul Latif Bhitai in English. 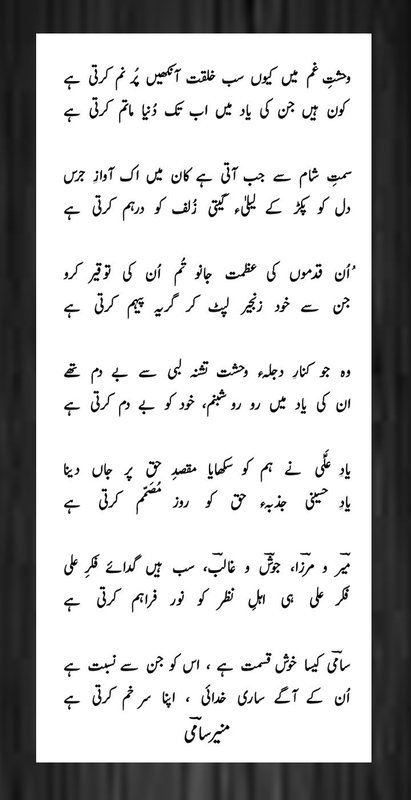 Friends, in my anguish over the attack on Paris, I reverted to one of Urdu language’s foremost poet Jon Elia. In this poem, titled Shehr Ashob, he exposes the evil and falsehood propagated by the clergy in Islam, and acceptance of such by the intellectuals in all times. It also exposes the intellectuals for bowing down to such falsehood and kings to gain personal material benefits. And criticizes those intellectuals who raise apologia to defend the actions of clergy and its stooges. It is in Urdu, and the above synopsis covers it for those who may not read Urdu. THERE can be many ways to announce the end of an era. Saeed Mirza made Naseem, for example, a delicately poignant film that turned the 1992 demolition of the Babri Masjid in Ayodhya into a metaphor for the unravelling of the Nehruvian promise. Saeed staged a cinematic coup of sorts, in fact, by getting the leftist poet Kaifi Azmi to agree to essay the waning of the Indian dream. He excelled in his role as the doting grandfather of Naseem, a curious, fun-loving Muslim schoolgirl, like so many of her age from the pre-1990s Mumbai. At the end of the story, Kaifi passes away quietly in his bed on the day of the Ayodhya outrage, leaving Naseem distraught but also equipped with his simple, unassuming insights into life, to cope with the challenges the cataclysmic day would usher. Saeed’s schoolgirl reminded me in a way of a skit by American playwright e.e. cummings that we staged in Aligarh’s Abdullah Hall (a rare peep for any man behind the walls of the chronically gated women’s college). A girl in the one-sentence play wakes up on the bench in a park, and says: “What a beautiful day.” The sun falls down from the sky. The stage goes pitch-dark. Haven’t there been a few other occasions in history when darkness descended when it was least expected, often at the high noon of an otherwise promising day. S.M. Mehdi, who passed away in his sleep in Aligarh last week, had for most of his 90-plus years dreamt his own version of unselfish dreams, hitched mostly to an embarrassingly abiding faith in the fellowship of man. In that quest early on he befriended Kaifi Azmi in Kanpur in the late 1930s, and drafted him into the communist party of which he was already a member. They had a third friend, Munish Narain Saxena, a thoroughbred Lucknow Kayasth, a raconteur and a wit who possibly spoke better, easier Urdu than his two comrades. Over a stretch of time, Mehdi became known to an entire generation of young admirers as Maamujan, so much so that Doordarshan serialised his scribbled notes about his comrades recently, as Maamujan ki Diary. His comrades and alliances ranged from Faiz to Hameed Akhtar, from Ahmed Ali Khan to Sajjad Zaheer. Let me share some memories from years of conversations with Maamujan. They describe what seems like an improbable era he belonged to, and also give hints of how Naseem’s dream could have been saved from destruction. Munish Chaacha, as we knew Mehdi’s life-long friend from Lucknow, was a hands-on communist pamphleteer who rode a rickety old scooter with an oversized helmet for a large portion of the life he spent in Delhi. In Mumbai he edited the Hindi Blitz while having a tough time coping with a strict disciplinarian of a wife, a sister of K.A. Abbas’s wife. In Lucknow, when Mehdi’s sister had gone away to Lakhimpur Kheri for a longish stretch with her husband, the trio of Mehdi, Kaifi and Munish converted their 17 Kutchehry Road residence into a commune. Before he became a more astute communist, Kaifi was a devotee of Hazrat Ali, and a few of his early poems about human brotherhood were culled from traditions surrounding the iconic Islamic figure. The poet became popular for his deep hypnotic voice though initially, according to Maamujan, he liked to croon his poetry in tarannum. Mehdi and Munish found it insufferable and threatened to walk out if he sang off-key once more. “Utho dekho wo aandhi aa rahi hai,” Kaifi was immersed in his newly composed verse at Kutchehry Road one day. Sit up and watch the storm approach, would be a rough translation. It was a hot and dreary afternoon. Munish, halfway into his siesta, was in no mood to brook the grating on his ears. “Yaar, tumhari aandhi ko dekhney ke liye uthna zaroori hai?” (Is it necessary to sit up to watch the storm you are imagining, Kaifi?) His protest registered, Munish turned his back on the unmoved friend. It was a tribute to this bonding that Munish found himself playing Shabana Azmi’s father for her school admission in Mumbai. It was a requirement that the parents be able to express themselves in English. Sultana Jafri, wife of fellow poet Sardar Jafri, played Shabana’s mother before the school principal. On another occasion, Munish could have been an inspiration for Mother Teresa. He was the one who cleaned the festering stench from the blisters of friend and comrade Majaaz Lucknavi. It was Munish, according to Maamujan, who took the tragic hero home, nursed him, and put the self-destructive poet back on his feet. In 1970, Sheila Bhatia (her partner Hali Vats had been a gun-runner for the communist party) directed Mehdi’s play Jaan e Ghazal, the story of Urdu poetry in a musical format. Begum Akhtar had composed the music, the only time she did so for the stage. Madanbala Sandhu was the heroine. I have yet to come across someone who can sing and act on stage with aplomb as Madanbala did. Unfortunately, in the year of Begum Akhtar’s centenary, I have been searching with no apparent success for men and women who can help revive the magical musical. In recent years, when Maamujan had gone totally blind, he would continue to share his thoughts with the youngsters whose attention span for history was flagging. As an Indian communist, he had a preference for the middle of the road P.C. Joshi against an implacably radical B.T. Ranadive. Various videos where S M Mehdi shares important cultural historical events of India. Click each link to listen. S M Mehdi on his own life. Abul Kalam Azad was a distinguished politician of India, and renowned scholar and intellectual of Urdu language. During the anti Imperialist struggle he was jailed for about four years along with Pandit Nehru and others at a fort in India. During his incarceration he wrote a series of memorable letters of high literary, historic, and scholarly value. These were not allowed to be sent out of jail and were later published as Ghubar e Khatir. Abul Kalam Azad used to drink and enjoy tea. I share a later exclusively discussing the cultural practice of tea drinking in India , and his own, Pandit Nehru’s and others choices. You can also read the entire Ghubar e Khatir at the following link. I share this personal note from illustrious poetess Perveen Shakir that she wrote in my diary in 1972, when I was moving to IBA in Karachi to obtain my MBA. She was a kind and caring friend. This is a memory I cherish, and share it to remember Perveen Shakir. Salam in honor of the martyrs of Karbala in Urdu with an audio. I present a Salam in honor of the martyrs of Karbala and the family of Prophet Mohammad. 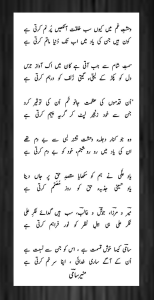 I am sharing a Manqabat in Urdu remembering the martyrdom of Imam Hussain. Please click the link to access image and audio.